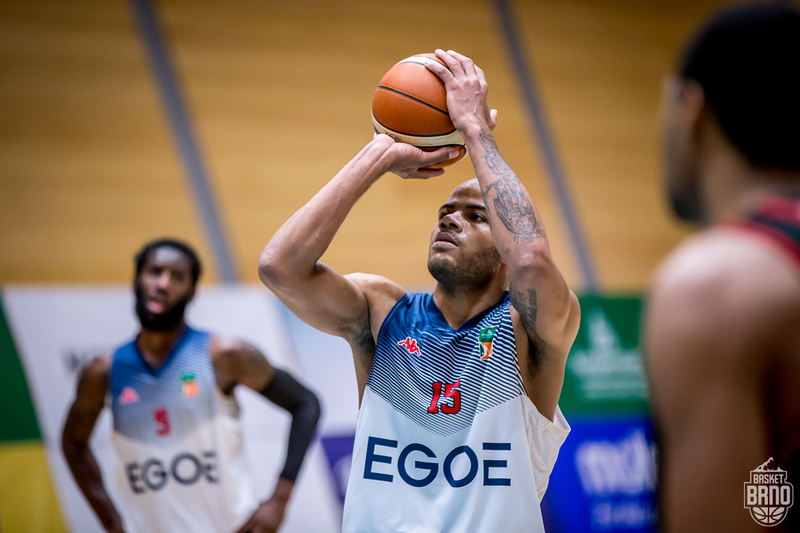 Reggie Keely averages 14 points a game for egoé Basket Brno. Photo credit: Jan Russnák. Brno, Jan. 30 (BD) — Kometa offense wakes for final round of regular season, Brno women’s basketball building to big rivalry game next Wednesday and the Brno sports schedule. It has been a season of ups and downs, powerful alley-oop slam dunks and suspect defense, the end of one head coach’s term and the beginning of another — yet, on Saturday, egoé Basket Brno is in position to earn a berth in the upper tier of the Koopertiva NBL for the remainder of the season. Ninth-place Brno (7-14) will host last-place Kingspan Královští sokoli on Saturday at 6 p.m. A win and Brno is, most likely, guaranteed another year in the top league. The three other teams that have a chance to advance have tougher schedules. USK Praha (7-14), which is listed in eighth place by virtue of points scored, and tenth-place NH Ostrava (6-14), which has a game in hand, both have a large obstacle to overcome: undefeated powerhouse ČEZ Basketball Nymburk. GEOSAN Kolín (6-15) plays its final game at fourth-place Pardubice and would require a lot of help in order to earn the berth among the top eight teams. If Brno loses, they still have tie-breakers in their favor, but it would definitely be more complicated. Though Brno is considered the favorite to win its final game against Královští sokoli, it is by no means a slam dunk, so to speak. Brno lost when it travelled to Hradec Kralove on Nov. 21 and, since then, Královští sokoli lost at Praha by a point and beat both Kolín and Ostrava at home. Group A1 would guarantee that Brno would stay in the Kooperativa NBL next season and it would also provide a competitive schedule, with home and away games against the seven teams above them in the standings. Only three of Brno’s seven wins were against these top teams during the first part of season. The bottom four teams go into Group A2. HC Kometa is getting hot. The two-time defending champions scored 11 goals in two homes games last week, beating Zlín, 4-2, on Sunday and Chomutov, 7-1, on Tuesday. Throw in the preceding road victory in Prague, where they beat Sparta, 1-4, and they have outscored their last three opponents 15-4. Karel Vejmelka, the 22-year-old Kometa goalkeeper, led the defense in all three games. The game against Chomutov — which featured two goals by Martin Zaťovič — was the first of the final round of the regular season. There are 12 games left, with one against each of the remaining teams in the league, before March 8. Then the postseason begins. Bedřich Köhler had two goals against Zlín. The rest of the goals are generally spread around to many different players, which has been a trademark of the team’s success in recent years, making the offense tough to defend. This week, Kometa travels to play Plzeň on Friday. Then they rest during an international break, resuming with a road game at Mlada Boleslav on Feb. 13 for a game that will be on ČT Sport at 5:20 p.m.
KP Brno is 10-3 and officially in second place in the ZBL. Žabiny Brno is 10-4 and in third. Next Wednesday, the two teams will finally meet for the first time this season: Žabiny Brno will host KP Brno at 6 p.m. In the meantime, both teams will take the court one more time as they work to incorporate the new additions to their rosters for the stretch run of the regular season and what they hope will be a strong showing in the postseason. Žabiny Brno added Kateřina Zohnová, a member of the Czech national team at the 2012 London Olympics. KP Brno Reem Moussa, a 24-year-old Egyptian American, and Czech international Lenka Bartáková. BK Žabiny Brno will host A3 Basket Umea on Saturday at 6 p.m. in a EWBL game. The next day, on Sunday, KP Brno will travel to SBŠ Ostrava for a 4 p.m. tip off. One-win Teamstore Brno hosted two-win SBŠ Ostrava on Sunday, but the local team could not get out of the bottom spot of the standings, losing 66-85. — Women’s Baksetball (EWBL) — BK Žabiny Brno X A3 Basket Umea, 6 p.m.
— Women’s Basketball; Žabiny Brno X KP Brno, 6 p.m.
— Women’s Basketball: KP Brno X Sokol Hradec Králové, 3:30 p.m.
— Women’s Basketball: Teamstore Brno X ZVVZ USK Praha, 5 p.m.
— Women’s Basketball: U19 Chance X Žabiny Brno, 5 p.m.